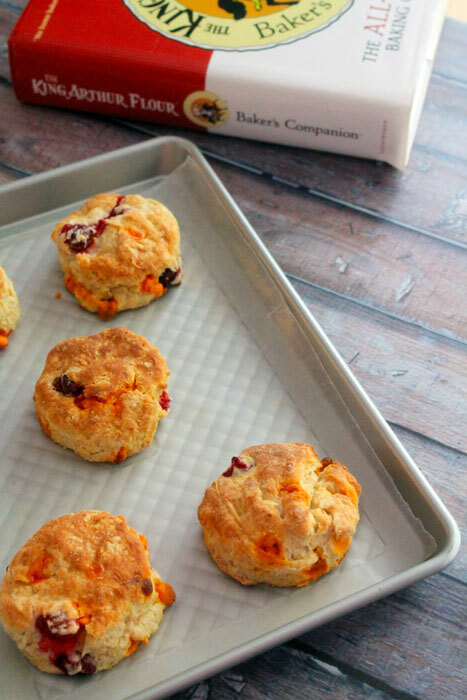 Cranberry Pumpkin Spice Scones combine my favorite flavors of Fall into one delicious treat. I eat them for breakfast and tea time, and you should too! You know, I’ve come to realize that I miss baking. More often than not, I let the kid and the job come first, which of course, they should. But every mama needs a little “me” time, and my me-time really needs to be spent baking more often. Take these scones, for example. I hadn’t made scones in absolutely ages. Then I picked up these sweet little Pumpkin Spice chips from Target (oh, Target. Just shut up and take all my money! ), and knew they had to go in something epically delicious. In the past couple of months, I’ve had another thing taking up my time – physical therapy. Back in September, Evan and I fell in a pot hole (thank goodness, he was fine). I, however, fractured my ankle in two places, tore a ligament, and have a pretty deep bone bruise. Between hobbling on crutches, then a giant black boot, then an ankle brace and PT three times a week, I feel like I sort of lost all of September and October, and just sort of barely held on. Through Evan’s birthday party, traveling back and forth to Austin for a (fabulous) conference, all of it seemed ten times harder because of my dumb foot. I’m glad to say that I’m finally on the mend, and moving towards having a minute to breathe, and maybe even a minute to BAKE. These scones came about because my dear friend Paola was kind enough to help me with EJ a few days a week. “Baking scares me,” she said. “Cooking is easier,” she said. I set about to prove her wrong, and I hope I did. 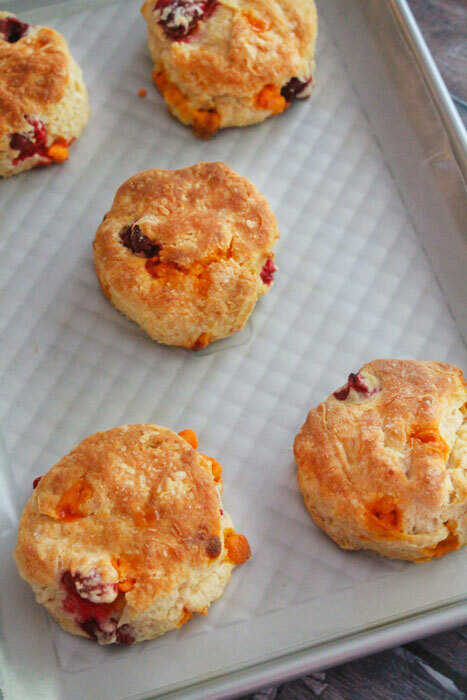 Scones, like biscuits, are one of the easiest things you can make when it comes to baking. So long as you’ve got some frozen butter, you’re halfway there. We added fresh cranberries because they’re one of my absolute favorite berries to bake with, especially this time of year – though if I’m honest, I’ll happily bake with them in July. Baking transforms fresh cranberries. They get sweeter, and they burst forth with their tart, tangy flavor in an irresistible way. I highly recommend having this book in your collection if you like baking even a little bit. 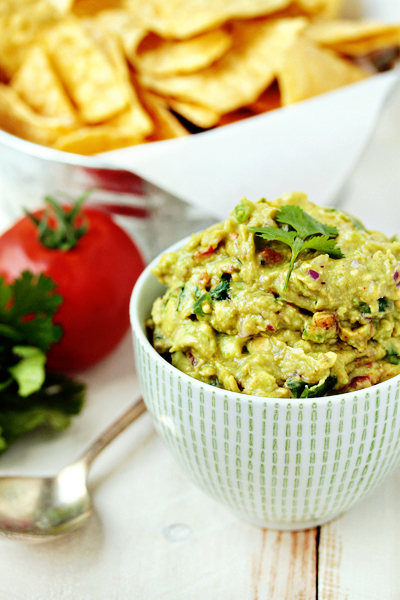 There are so many tips, tricks, and solid recipes. It’s a tome worth having. If you can’t find the Pumpkin Spice baking chips, feel free to swap in any type of chips you like. White Chocolate Chips would be lovely. 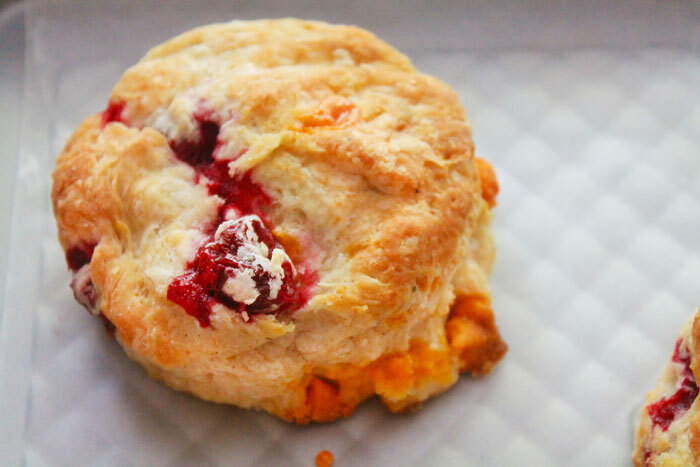 Cranberry Pumpkin Spice Scones are everything Fall is about. Serve them warm with your favorite tea! Line a baking tray with parchment paper or a silicone liner. Set aside. In a large mixing bowl, combine flour, sugar, baking powder, and pumpkin spice together. Use a whisk to combine and aerate these ingredients. Use a cheese grater to grate frozen butter directly into flour, then toss with a fork to distribute evenly. Add cranberries and baking chips to the dry ingredients, tossing with the same fork gently to distribute and cover with the dry ingredient mix. This helps these mix-ins to sit well in the scones, rather than sink or rise. In a separate small bowl, combine pumpkin and eggs, mixing together to make a smooth liquid. Add to the dry ingredients, working slowly and gently to combine the wet ingredients into the dry. This may be easiest done with your hands. Form the dough and flatten until it's about 3/4" thick. You can either shape it into a round and cut wedges, or use a biscuit cutter like I did for round scones. Brush each scone with milk, and sprinkle with sparkling sugar if using. Freeze the scones for at least half an hour. Bake for 22-25 minutes, until each scone is golden brown. Oh wow!! The new site looks soooo good. Definitely more “you”! And these scones look awesome as well! I love the new look of your site, Amber!! 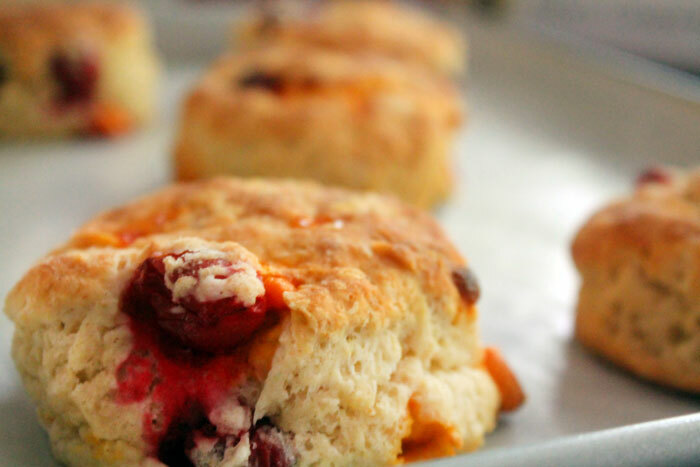 And these scones…yum! Thanks, Julie! It’s slowly comin’ along. 🙂 I happen to know these pumpkin spice chips are on clearance at Target right now. You should grab some before they’re gone!